Like many fellow cruisers, I can't think of tools I regard as more indispensabile than my navigation charts and OpenCPN, my favorite chart plotter and navigation software. Both definitely fall in the category of "don't leave port without them". They do not offer visual clues as to how the location will actually look like. So they are great for ...well...navigation, but are somewhat lacking when it comes to planning a route and choosing among a number of potential destinations along the way. They are sometimes not up to date: new structures (dock, bridges etc) may have been added since the chart was last updated. In some cases, they may not be 100% accurate. On the last point, I was recently reminded of how charts in developing countries may be affected by significant offsets while cruising in beautiful Baja California, where some charts were last compiled long before GPS became available, and were off by as much as a mile in a few cases! So I found myself using Google Maps as a way to complement my route planning exercises. And then I started asking myself: what if there was a way to view Google Maps (particularly the satellite images) right within OpenCPN? And perhaps save them to my hard disk so that I didn't have to depend on Internet connectivity? While not designed for navigation, Google Maps are becoming an important compendium to route planning, working side by side with traditional navigation charts. Satellite imaging provides a great way to see how our destination actually looks like: how wide is the beach by the anchorage? Is the land covered in vegetation? Are there any unsightly buildings or industrial facilities in plain view from the anchorage? Of course, we could always fire up our browser and go to maps.google.com to take a look. But what if we have no Internet access, as in most cases when cruising? Enter a new feature in squidd.io: downloading google satellite images for any of the thousands of destinations in a format that is compatible with OpenCPN, and can be viewed offline and superimposed to other raster (.kap) navigation charts. 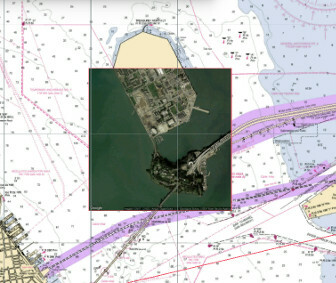 Maps can be downloaded at different levels of zoom: from highly detailed small scale charts for a specific marina or anchorage, to large scale charts covering entire regions. Navigate to the location you are interested in on sQuidd.io. (for instance, the Treasure Island anchorage shown in the image above, in the San Francisco Bay) . I find it very convenient to do this directly from within OpenCPN using the squiddio plugin. On the Google chart, select the level of zoom you need for the chart. I normally download a high-definition 1 x 1 nautical mile chart covering the anchorage, and a larger, say, 6 x 6 NM lower definition chart covering the vicinity. If your itinerary covers multiple destinations, you can create a patchwork of different charts so that the entire area is covered at different levels of zoom. Use the + and - control on the Google map to adjust the level of zoom. See the table below for indicative chart sizes relative to their Google Maps zoom level. Click on the download chart button, right below the map in the destination page. In a second or two your .kap file will be available on your hard drive. Copy the file (or files) to your OpenCPN chart directory (go to Settings/Charts to find the directories OpenCPN is using). I use Chart Groups extensively to organize my charts in OpenCPN, so I have created a specific group for Google Satellite Maps, which are saved to a directory contained within raster chart directory. This way I can view only and all the Google charts I have downloaded, or view them "quilted" with the other raster charts (which is useful when wanting to assess the accuracy of old raster charts). Update the chart database in OpenCPN (again, Settings->Charts->Scan Charts and Update Database). You are done! You can now view your Google Map in OpenCPN like you would any other chart. Zoom in and out, pan, hide them, see your boat's position on them, measure distances, create routes etc. Remember though, Google Maps were not designed for navigation, so stick to your navigation charts for the real thing, using Google Maps for route planning or verification purposes only. Like anything on sQuiddio, this feature is entirely free, so play around with it and let me know what you think.